Welcome to the very first Pandaren Ponderings! Thats right, from now until I deem it “done” this will be a semi regular article I will be writing on World of Warcraft: Mists of Pandaria. As of this moment the game is in a closed beta state and anything and everything I report on is subject to change. The good thing here is that I have no NDA so whatever I see or do I can talk about and show off to you fine people, so lets strap in and talk about my favorite MMO and hopefully yours too if you’re reading this! Standard Box/Standard Digital: for 39.99 you will get the standard edition game just the content with no fluff in your choice of a digital download or a box copy if you prefer the retail route. Digital Deluxe: New for the first time it’s basically a digital version of the collectors edition. For 59.99 you’ll get the standard game via digital download as well as the Imperial Quilen flying Mount (WoW’s version of a Fu dog + wings if you ask me), the Lucky Quilen cub vanity pet a smaller way too cute version of the mount to follow you around. Also included are other Blizzard game bonuses a banner accent and sigil set for Diablo III and a set of profile pictures for Starcraft II: Wings of Liberty, Infested Orc and Night Elf Templar. Collectors Edition: Finally ringing in at 79.99 (and my box of choice since I started, can’t help it) the boxed collectors edition gives you everything listed above as well as : A dvd/blu-ray behind the scenes and making of info, a CD soundtrack (worth the price of admission alone here, seriously always good music on this) and a mouse mat featuring my favorite Pandaren and yours, Chen Stormstout. Good to finally have the details on all this. Now navigate either physically or via the interwebs to your store of choice and make your preorder! Keep tuned in for more Mists of Pandaria news here. August 16th will see the premier of the games cinematic at Gamescon! I’ll be sure to cover that and I’m slowly working on an ongoing feature for the game as best I can with my currently gimped beta access. Hoping to have more out soon! If you asked me a few years back who Freddie Wong was, I would be at a loss for words. I was only exposed to his work a year or so ago. Stumbling upon an amazing Portal gun video, I immediately looked up all of his other now famous works. From Rocket Jump to his Real Life Mario Kart, all his effects based comedy videos are wonderfully produced and a joy to watch for gamers and indie film enthusiasts. His most recent work is a continued collaboration with Brandon Laatsch and titled Video Game High School, an episodic, comedic action oriented web series based on a fictional High School for video game characters, was extremely well received by the throngs of normally very critical reviewers known as the common internet viewer. (Editor: Ha! Wordplay.) A second season, we are told, will soon follow. First off, let me apologize for the audio situation. Due to a huge pre-interview mix-up Steven ended up working with someone who clearly over-estimated their filming equipment; thus we have been left with lessened audio and an awkward filming angle. To clarify, this person is not and will never be affiliated with Constantly Calibrating or SilverHam Media. Still, do not let these facts discourage you for if you do you will miss out on a highly entertaining interview from the master of charismatic encounters, Mr. Steven Needham (@DarthSir). While I wasn’t present for this interview, let me just say that it ranks as one of my favorite from RTX. It’s a travesty that we don’t have better audio and video for it, but I’m sure we’ll talk to Grace more in the future. She is a sweet, hilarious, and overall amazing person. You should go check her out in all the places she resides: Twitter, YouTube, & Tumblr. 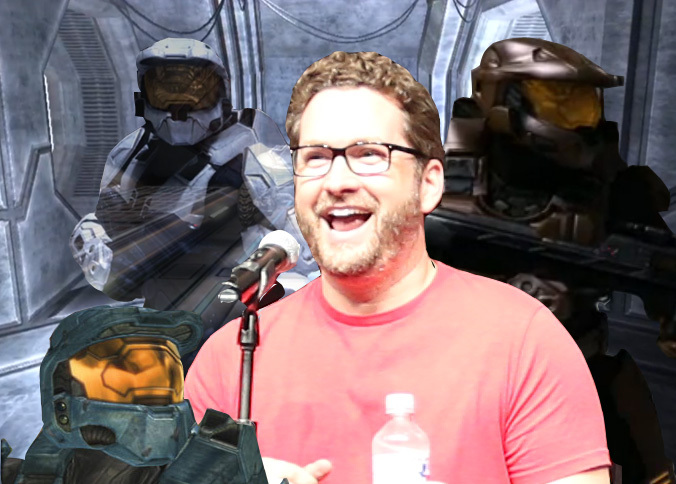 Burnie Burns voices Church, Lopez, Epsilon, and many more on Red vs Blue. Shortly after our interview with Gus we were given a few minutes to chat with Burnie Burns, CEO and Co-Founder of Rooster Teeth. You might also know Burnie as Church, Vic, Epsilon, and many, many more characters on Red vs Blue. Burnie is also the writer of RvB. I have said this numerous times over the last week, but Burnie is the nicest person I have met in my entire life. I’m blown away by how friendly and forthcoming he is with any and all fans; media included.